Jill Galvan is the author of The Sympathetic Medium: Feminine Channeling, the Occult and Communication Technologies, 1859-1919. Her past research has focused on long nineteenth-century media technologies, spiritualism, mesmerism and psychical research and on both Victorian and contemporary ideas of the posthuman. She is co-editor, with Elsie Michie, of the essay collection Replotting Marriage in Nineteenth-Century British Literature. Her current monograph project, After Romance: Alienated Marriage and Modern Character Realism, examines the formal dimensions of character in late Victorian and early twentieth-century marriage stories. 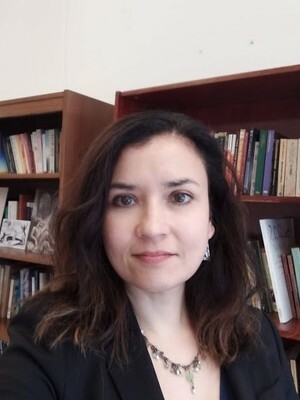 She is lead organizer of the North American Victorian Studies Association 2019 conference. She regularly teaches courses on the novel and poetry of long nineteenth-century Britain, and recent specialized courses have included topics in Charles Dickens, Oscar Wilde, the Gothic, the fin de siècle, and the family/marriage plot. Replotting Marriage in Nineteenth-Century British Literature. Co-edited with Elsie Michie. The Ohio State University Press, 2018.
" Corelli’s Caliban in a Glass: Realism, Anti-Realism and The Sorrows of Satan." English Literature in Transition 1880-1920, vol. 57, 2014, pp. 335-60. "Tennyson's Ghosts: The Psychical Research Case of the Cross-Correspondences, 1901-c. 1936.” BRANCH: Britain, Representation and Nineteenth-Century History, ed. Dino Franco Felluga. (Extension of Romanticism and Victorianism on the Net, 2012). "The Victorian Post-Human: Information, Transmission and the Séance." The Ashgate Research Companion to Nineteenth-Century Spiritualism and the Occult, ed. Tatiana Kontou and Sarah Willburn. (Ashgate, 2012). The Sympathetic Medium: Feminine Channeling, the Occult and Communication Technologies, 1859-1919. Cornell: Cornell University Press, 2010.